Warm juicy pineapple roasted to a golden brown; sprinkled with cinnamon and evaporated cane sugar. Could heaven be any closer? Ever since I went to Brazil I have been in love with their food, especially the Brazilian BBQ. Eating this for the first time was a Aha moment, ‘why did I think of this’ or why don’t you find this in the Philippines? 2 Cut off the crown (leaves) about a 1/2 inch of the top and bottom of the fruit. 3 Cut the skin off leaving as much of the pineapple as possible the only part of the skin that should be left is the ‘eyes’. 4 Doing a spiral cut remove the eyes. 6 As the Pineapple is rotating, brush the pineapple with the melted butter. 7 Mix the crushed cloves, cane sugar and cinnamon together. 8 Sprinkle about a third of the mixture over the pineapple while it turns and thickly as possible. 9 When the pineapple starts to brown, brush it again with butter and sprinkle another 3rd of the mixture over it while its rotating. 10 After 5 or 10 minutes; brush it again with butter and sprinkle the last 3rd of the mixture over it while its rotating. 12 Serve warm with Vanilla Ice Cream or Whipped Cream. I use my indoors all the time, but it depends on what you are cooking. It will be no more stinky/messy then cooking on your stove top. 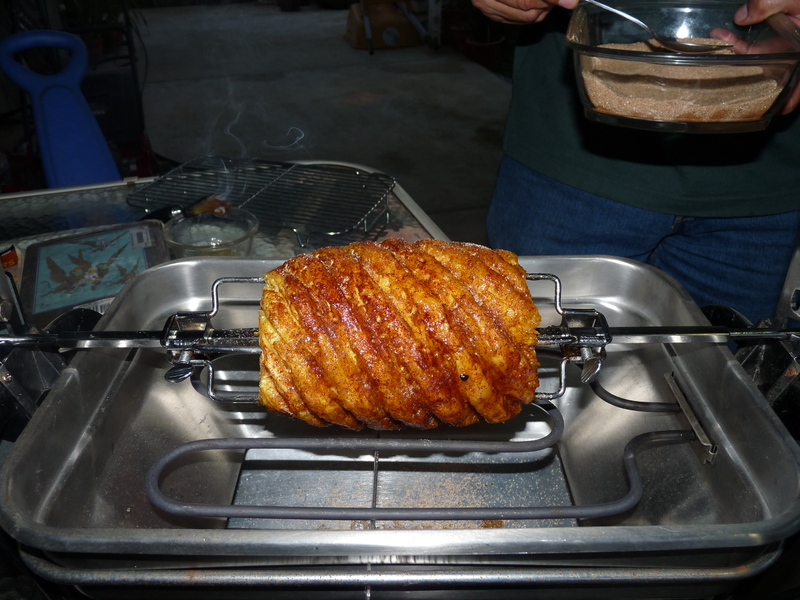 When I cook things like pork roast I will sit it on the oven top and use the vent exhaust fan. I do cover the inside of my open hearth and try with foil to make cleaning easier. There is not allot of smoke from these because it cooks rather slowly so only if some thing falls on the heating element, because it slow most of the oils and moister rolls to the lowest point and drips so most missis the heating element altogether.